The eyes are often the first part of the face to show significant signs of aging, such as sagging or drooping lids, bagginess, and puffiness. With blepharoplasty, also known as eyelid surgery, experienced plastic surgeon Dr. Tiffany McCormack can address and reverse these signs of aging. Patients who choose blepharoplasty can enjoy a well-rested, more youthful appearance. When excess skin and pockets of fat begin to accumulate above or below the eyes, this can cause men and women to appear older or more tired than they feel. Blepharoplasty is a surgery performed on the eyelids that is designed to tighten sagging skin and remove or reposition fat deposits. Sagging or “hooded” upper eyelids can prematurely age a patient or make it difficult to apply eye makeup. In some cases, drooping of the upper eyelids may become so severe that the patient’s vision becomes obstructed. 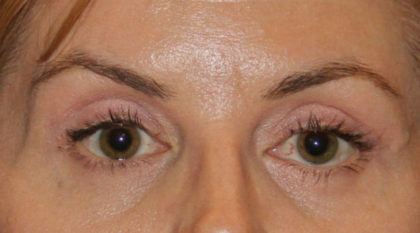 Sagging of the lower eyelids may cause under-eye bags, puffiness, or deep tear troughs. By removing excess fat, repositioning the remaining fat, and removing excess skin, Dr. McCormack can achieve results that look youthful and natural, as well as restore the patient’s full field of vision. Ideal candidates for eyelid surgery will be in good overall health and maintain realistic expectations in regard to the results that can be achieved with the procedure. Patients who have sagging eyebrows in addition to drooping upper eyelids may benefit from combining eyelid surgery with BOTOX® Cosmetic or a brow lift for a more complete rejuvenation. In addition, blepharoplasty is not typically beneficial for correcting dark circles. However, fat grafting or dermal fillers may decrease the shadowing caused by grooves, thereby reducing the appearance of dark circles. Patients often choose to combine blepharoplasty with a dermal filler such as JUVÉDERM® to fill in deep creases or grooves, sometimes known as tear trough deformities. Each blepharoplasty is custom-tailored to meet the unique needs and goals of the patient. 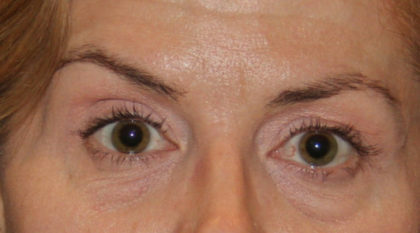 The procedure can be performed on the upper eyelids and/or the lower eyelids. Upper eyelid surgery is used to remove excess fat above the eye, tighten any loose skin, and recontour the remaining fat for a smoother, more defined appearance without looking overdone. This type of blepharoplasty can also improve the vision of any patient with upper eyelids obstructing their field of vision. Lower eyelid surgery is used to remove pockets of fat below the eye, reposition existing fat to rejuvenate the appearance of tear troughs, and repair any skin laxity that may be causing folds or creases. Patients who have concerns about their upper and lower eyelids may choose to combine the two procedures to maximize the impact of their results. The surgical plan for blepharoplasty will vary depending upon which type of blepharoplasty is performed. In most cases, eyelid surgery is an outpatient procedure performed under local anesthesia and takes about one hour to complete. Dr. McCormack takes great care to place incisions along the natural creases of the eye or along the lash line to minimize the appearance of any scarring. During upper eyelid surgery, an incision is made along the natural crease of the upper eye. Dr. McCormack can then remove any excess fat, contour the remaining fat, and excise any excess skin. Loose muscles can also be tightened at this time to further reduce laxity. During lower eyelid surgery, an incision is made along the lower lash line. Dr. McCormack can then reposition and contour any excess fat to fill hollow-looking tear troughs as well as repair any underlying ligaments that may be contributing to sagging of the lower eyelids. Excess skin will also be removed to create a smoother, more youthful appearance. If you are interested, we invite you to view our eyelid surgery results gallery, which features many of our Reno patients’ results. If you would like to schedule a consultation with Dr. McCormack to discuss your options for facial rejuvenation, please call us at (775) 284-2020 or fill out our online contact form. What Can I Expect During Eyelid Surgery Recovery? Patients can expect mild swelling, soreness, and bruising around the eyes immediately following their procedure. Oral pain medication and lubricating drops can be used to manage any discomfort. These side effects typically dissipate within a few days. Most patients return to work within 7-10 days. Residual scarring is usually minimal and fades within a few months of the surgery. For more information about eyelid surgery and brow or forehead lift surgery, we invite you to call us at (775) 284-2020 or complete our online contact form and Dr. McCormack will respond to you personally.